Spending some quality time with good company is priceless, especially at night. Outdoor string lighting can help make your time together more enjoyable than ever before. Its a great way to decorate your outdoors because of its ease of setup and flexible uses. 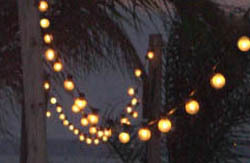 Make your backyard more fun, use string lighting for your backyard parties, barbecues, bar, patio, or deck. String lights come in many shapes and sizes to suit your lighting preferences. Its common for people to use outdoor Christmas lighting as a source of string lighting since often they are readily available and easy to find. Decide on the perfect outdoor theme for your outdoor string lighting project. Find some cool bulb shapes that really make your lighting get noticed. A big mistake is to use different bulb shapes on the same line with no rhyme or reason to it. Its best to use the same style string lights, preferably made by the same manufacturer. Keep your string lighting consistant. If you decide to use outdoor LED lighting, make sure to only use LED lights preferably by the same manufacturer. It sometimes seems easier to link string lights made by different manufacturers together. Beware that you run the risk of having a design that clashes since each manufacturer makes their bulbs emit a slightly different color which won't match exactly with the rest of them. Choose the color that fits your outdoor party theme best. Clear white bulbs are fine as long as they fit the design you are looking to achieve. Adding a colorful flare to outdoor string lighting is a perfect way to compliment your theme. Colorful string lights can be used for holiday events, special occasions, or for any outdoor parties you wish to have. An alternative to colorful light bulbs are light bulb covers. You can create the effect of a colored bulb by installing colorful covers onto your string lights. Light covers can add color to your lighting if you choose but can also be a decorative addition to your outdoor lighting theme. Use light covers as decorative pieces for your fun parties or simply as an alternative to traditional lighting methods. Another fun way of adding color to your party is to use colorful lanterns. They come in many different shapes, sizes, and themes. If your an artistic type, you may want to use your outdoor Christmas lights and make your own decorative lamp covers that fit over them to compliment your outdoor party lighting theme. If your not so artistic or are short on time but still want to create that special theme for your outdoor event, consider purchasing your string lights at your local party store. String lighting is one of the easiest ways to decorate your exterior. It requires very little effort and a minimal investment. One thing is for sure, outdoor string lighting must be fun and designing that fun environment should also be fun. Think about your location. Where do you plan on entertaining and what kind of theme do you have in mind. This will determine your mounting design. Be creative, one idea is to try to make it look like a display of small stars gleaming overhead. A zig zag pattern of overhead lights provides pleanty of ambient light and creates a cool design using the dark night sky as the background. You may decide to plan your lighting pattern around the perimeter of your outdoor entertaining area. Try wrapping the corner posts with string lighting to create a decorative boundary. Use your own creative juices to make your outdoor string lighting fun and inviting. Properly mounting string lights is extremely important to your overall design. Think about where the best location would be to mount them. Overhead is usually the favorite so find the connecting posts necessary to hold your string lights up. If no connecting posts are available, purchase some at your local hardware store or make your own. Mounting hardware for sting lights can make your life much easier and will help you create a neat and organized setup. You can find mounting hardware at your local electrical shop or hardware store. Keep your string lights out of the way of moving traffic. Decide where people will be moving about. Mount your string lights high enough so that nobody gets tangled up in them. You want to make sure that your guests don't need to duck under strands of lights. That can get very annoying, especially if your hosting the party. The most important thing in laying out your sting lighting is to keep it simple and make it fun. Since most string lighting is temporary, you can usually get away with simply linking each strand together and connecting the line right to an ordinary outlet. 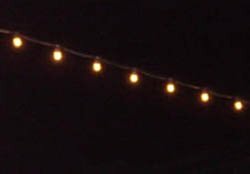 At times however the amount of power needed to light multiple lines may not be enough to support all your string lights, causing them to short out. If this occurs, the easiest solution is to disconnect some of the lines and use an extension cord to re-route a portion of the lights to another outlet supported by a different circuit. This usually occurs because there is not enough voltage supplied through that circuit to support the load of all of the string lights installed. This is similar to cable voltage drop which sometimes occurs with low voltage transformers. If your plan on leaving your string lights on throughout the year or plan on using the same layout time and time again, you should consider more permanent alternatives. Knowing how many watts your lights will need to function properly is pertinent for your string lights to function without any problems. Determine the total wattage your design will need. Most string lighting will tell you how many watts a line of sting lights consumes right on the box. Multiply that number by the number of strands you anticipate using in your design. It is best to now consult with a licensed electrician to help to install an extra circuit for your string lights to work. Although this may seem complicated, rest assured that most outdoor string lighting usually doesn't require much more effort than plugging in an extension cord.